Serbians turned out to vote on April 2, 2017 to elect their next president. With elections called only a month before the date, the political stakes were high between then Prime Minister Aleksandar Vucic and a number of opposition candidates. The election was seen by many as a referendum on the policies and actions of Vucic, whose Serbian Progressive Party (SNS) represents the largest party in the ruling coalition in parliament after retaining their majority in the 2016 parliamentary elections. With a limited amount of time for candidates to campaign and amid a partisan political environment, Serbian citizen observer group and GNDEM member the Center for Research, Transparency and Accountability (CRTA) mobilized the mission “Citizens on Watch” quickly to monitor the campaign period and conduct a parallel vote tabulation (PVT) on election day. Following the election, CRTA is monitoring post-election developments. The election presented a unique situation for CRTA. While many elections are typically monitored by both international and citizen election observers, one of the main international observer organizations in Europe, the Organization for Security and Cooperation in Europe (OSCE) Office for Democratic Institutions and Human Rights (ODIHR), announced they would only be sending an assessment mission to observe the elections in Serbia. The 2017 election in Serbia saw fewer election monitors than in previous elections, putting additional attention and pressure on CRTA to present a non-partisan, accurate assessment of the election process. With a shorter pre-election period, CRTA’s 60 long-term observers only had a few weeks to monitor election preparations, the conduct of the campaign and the general political environment. The campaign period, while short, was notably marked by an uneven playing field and huge imbalance, creating unequal opportunities for candidates to campaign. CRTA found a significant number of cases where public officials on local level, directly or indirectly, campaigned for Vucic using their official position. 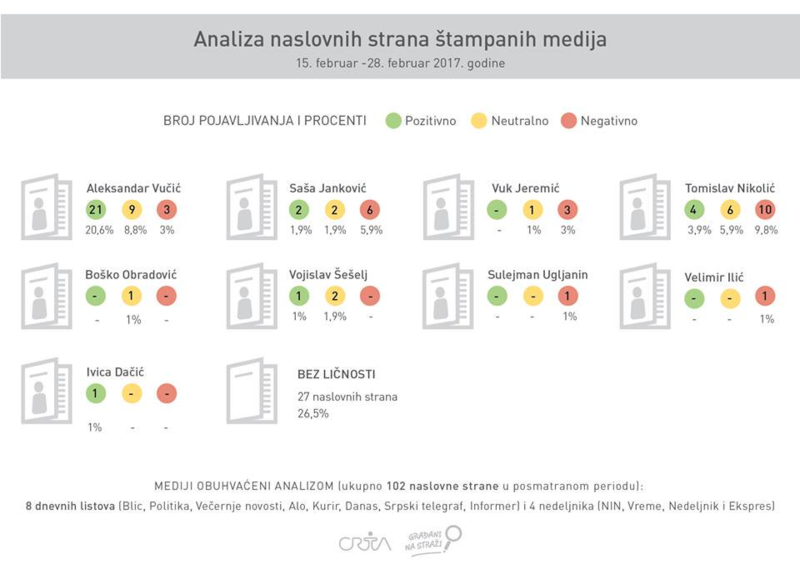 CRTA also found that Vucic enjoyed significantly less negative coverage on the front page of newspapers than the top two opposition candidates. They also found that given the short time period, the campaign was very intense and grew heated with reports of voter intimidation and hate speech. On election day, CRTA deployed 900 observers to a random, representative sample of 450 polling stations across the country to observe the conduct of the election, from the opening of stations through the completion of counting. In addition, CRTA deployed 60 mobile teams in every district to monitor election-related incidents occurring outside of polling stations. Before and on election day, CRTA used social media, namely Facebookand Twitter for the “Citizens on Watch” program, to disseminate videos and infographics, which helped to easily communicate their findings and data from the pre-election period and throughout election day. CRTA also broadcast their press conferences and infographics throughout the day on Facebook Live, bringing the important events to a different type of medium and engaging with an audience who may not have otherwise followed developments. CRTA’s observers found that 87% of polling stations opened on time, with only one polling station experiencing significant delays (more than two hours). While 44% of polling stations were accessible to persons with disabilities, representing a slight increase since the 2016 parliamentary elections. Observers were shown empty ballot boxes before they were sealed in 100% of polling stations, and found that voting irregularities, such as voting without identification documents or campaign materials within 50 meters of the polling station, occurred in only 3% of polling stations. While these problems were limited, CRTA did find that there were isolated cases of voters experiencing issues with the voters list, such as not finding their names on the list or the electronic list, which CRTA highlighted has remained a problem following the 2016 parliamentary elections. Following polling station closure and the completion of counting, observers obtained and sent polling station level results, where CRTA’s leaders in Belgrade quickly analyzed the findings. Due in large part to effective training of election day observers, CRTA received a 100% response rate from observers on election night, helping them to rapidly determine the results of the PVT. The PVT results were consistent with preliminary results from Serbia’s Republic Electoral Commission (RIK), which showed that Vucic won the first round election and cleared the 50%+1 necessary to avoid a runoff election. While their observation of the process on election day showed irregularities, CRTA determined they were not significant enough to alter the election results. Following election day and the announcement of results, protests erupted in the capital, Belgrade, and other cities around Serbia protesting Vucic’s win. Many of the protesters claimed that the election had been fraudulent, lamenting the election commission and the media for their involvement in creating an unfair election. CRTA’s assessment of election day processes and the PVT, as well as their ability to speak to the nationwide conduct of the election, revealed that the irregularities observed on election day specifically would not have altered the eventual election results. However, CRTA’s observation of the pre-election period exposed significant flaws in the process with a campaign marked by several types of unequal treatment of candidates. These issues should be addressed by electoral and political stakeholders and the media, and should be assessed for how the issues could impact future elections. In the days and weeks following the election, CRTA has continued to monitor the post-election environment. While protests continued, CRTA sought to ease tensions by requesting access to polling station records in order to compare them with the results photographed and acquired by CRTA’s observers. CRTA also filed 18 complaints related to election day violations and irregularities, of which three were adopted by the RIK. In the coming weeks, CRTA will release their final report on the presidential election, in which they will also offer recommendations to electoral stakeholders, including the media and election commission, on improvements and changes to be made before the next elections.